Webcast will feature the most recent hotel performance trends data as tracked by Smith Travel Research. Join Charlie Fritsch, president of Hotel Brokers International, and Jeff Higley, vice president of digital media & communications for STR/STR Global/HotelNewsNow.com, as they discuss the hospitality real estate industry market and opportunities for investment. “Self-Directed” is not a legally defined term, but an industry term for an account that allows the account holder to choose his or her own investments. It is an IRA that can accommodate Real Estate related investments along with a virtually unlimited list of other asset types! Whether you want to use IRA 401k money to buy real estate, make loans or buy notes, this course will teach you how to make it happen. Learn how to create the right investment vehicle, write an offer, finance investments with retirement accounts, and sell your investment today. Invest in what you know and make REAL investments for a secure future! In this session you will learn how to comply with new DOL requirements for tip pools, requirements to accommodate employees’ religious beliefs, disabilities and pregnancy-related limitations, and how to handle transitioning and transgender employees. We will cover the latest trends in local and state laws as related to criminal background checks, sick leave, scheduling, and mandates for housekeeping employees. We will have a timely discussion about how to prevent and respond to harassment and how to avoid becoming the next #MeToo employer. On December 13, Jeff Higley, vice president of digital media & communications for STR/STR Global/Hotel News Now, will join Tony DeGeorge, president of Hotel Brokers International, in a live webinar presentation of hotel performance data trends as tracked by STR. Jeff and Tony will discuss this year’s industry performance and share projections for 2018. What’s Better Than a 1031? A 1031 Plus! Many hotels use Section 1031 of the Internal Revenue Code (IRC) to defer capital gains taxes by selling a property and reinvesting the proceeds into a new property—referred to as a “1031 exchange.” Join us for this webinar and learn how to turn a 1031 transaction into a robust resource by eliminating the negatives and adding elements that enhance your bottom line with the help of this well-used section of the IRC. On November 2nd, Jeff Higley, vice president of digital media & communications for STR/STR Global/Hotel News Now, will join Diana Alt, president of Hotel Brokers International, in a live webinar presentation of hotel performance data trends as tracked by STR. Jeff and Diana will discuss this year’s industry performance and share their projections for 2017. The webinar will report on the most comprehensive research to date about hotel social media. Social media plays an ever-increasing role in a hotel’s business; therefore, it is necessary for hoteliers to understand its use and impact. The research study was conducted by Bjorn Hanson, clinical professor, Tisch Center for Hospitality and Tourism at New York University, and Donna Quadri-Felitti, director and associate professor, School of Hospitality Management at Penn State University. Their study findings were based on responses of U.S. Hoteliers, just like you, and include investment, staffing, objectives, room nights generated, and differences and trends by location, size of hotel, franchised/managed and other attributes. According to a recent report, U.S. hotels collected record amounts of resort fees and other surcharges totaling $2.47 billion in 2015, leading to main stream media coverage with sensational headlines such as “Hidden hotel resort fees not going away any time soon." The purpose of this webinar is to provide a balanced perspective regarding resort fees and other surcharges at U.S. hotels. The webinar will also explore the potential effects of what could be described as extreme increases in the minimum wage on the U.S. hotel industry. The Obama presidential administration as well as several large municipalities are actively seeking, or recently passed laws that increase the minimum wage by an extreme amount. The webinar will quantify the forecast effect on the U.S. hotel industry. Presentation featuring up-to-date hotel performance data trends as tracked by Smith Travel Research. Join H. Brandt Niehaus, president of Hotel Brokers International, and Jeff Higley, vice president of digital media & communications for STR/STR Global/HotelNewsNow.com, as they discuss the hospitality industry outlook for next year and opportunities for investment. H. Brandt Niehaus, CHB is President of Hotel Brokers International and President of Huff, Niehaus & Associates, Inc., a full-service hotel investment advisory firm. Mr. Niehaus has over 30 years of experience in hospitality real estate sales and consulting. He has successfully transacted the sales of hundreds of hotel properties from limited-service independents through full-service luxury hotels representing sellers in conventional sales as well as lender-owned transactions for banks and institutions. A consistent top sales producer, Niehaus was recently named Broker of the Year in recognition of his record-setting sales performance in 2014. Mr. Niehaus holds the professional designations of Certified Hotel Broker (CHB), Certified Hotel Administrator (CHA) and Certified Commercial Investment Member (CCIM). Jeff Higley serves as the Vice President of Digital Media and Communications and as Editorial Director of STR / STR Global / Hotel News Now. He oversees all aspects of the Hotel News Now (HNN) digital platform, including the Hotel News Now website and daily newsletter. Jeff also leads the STR family of companies’ efforts with corporate public relations and press releases. He is the former editorial director for Hotel & Motel Management magazine and has specialized in hotel industry journalism for many years. He frequently writes articles on the lodging industry. Data breaches strike all industries, but for the hospitality industry the stakes are extremely high, and the financial impact to a company can be significant. As an owner, controller or CFO, your responsibility now includes the safety of corporate data. We will explore how you can effectively work with IT to develop a risk management profile that protects your data and maintains your financial success. Meet the Panel: H. Brandt Niehaus, CHB, President of Hotel Brokers International and President of Huff, Niehaus & Associates, Inc., a full-service hotel investment advisory firm. Julie Eisenhauer, CPA is a shareholder at Clark Nuber, a CPA and consulting firm in Bellevue, Washington, where she provides audit, assurance and consulting services to privately owned companies. Peter Henley, CPA, CITP, serves as Clark Nuber’s Senior Director of IT, and is responsible for aligning IT with the firm’s strategic business plan and making Clark Nuber the most technologically advanced accounting firm in the Northwest. The June 24th Hotel Investor’s Marketplace webcast will focus on Hospitality Lending. HBI President Brandt Niehaus will be joined by Dennis Nessler, Editor at Large of Hotel Business to discuss the magazine’s recently completed survey of hospitality industry lenders and examine the types of loan products available in the market, requirements for generating hospitality loans and opinion on the status of the lending industry this past year and through 2015. The April 30th Hotel Investor’s Marketplace webcast panel will talk about The U.S. Economy and its impact on the Lodging Business. The lessons learned from past economic cycles, where we are in this cycle, and how it is different than previous cycles. They will discuss the economic barometers and what their indications mean for the hotel industry. April 30th viewers will have opportunity to ask questions of the panel and benefit from their combined 90+ years of industry experience. H. Brandt Niehaus is President of Hotel Brokers International and President of Huff, Niehaus & Associates, Inc., a full-service hotel investment advisory firm. Mr. Niehaus has over 30 years of experience in hospitality real estate sales and consulting. He has successfully transacted the sales of hundreds of hotel properties from limited-service independents through full-service luxury hotels representing sellers in conventional sales as well as lender-owned transactions for banks and institutions. Mark Woodworth is President of PKF Hospitality Research, (PDF-HR), a CBRE company. Mr. Woodworth has over 30 years of hospitality industry experience in both a consulting and hands-on operational capacity. Mr. Woodworth has managed and conducted consulting assignments, involving both the public and private sectors, throughout the U.S. He has worked for the industry’s leading lenders, developers, chains and management companies and has dealt with all aspects of operations, development and financing. Edward P. Walsh has nearly 30 years of experience in hotel real estate valuation, consulting, sales and finance. He founded Alpine Realty Capital to provide real estate investment banking services, including debt and equity raising, transaction services, and consulting. Mr. Walsh also provides development related services, including site selection and acquisition, market feasibility analysis, franchise and design recommendations, and capital structuring. Online reviews and social media are a blessing and a curse. On one hand, attention on social media and online can drive business. On the other hand, negative reviews can have a significant negative impact. While reviewers have a right to express their opinions without fear of litigation, reviewers may also be held accountable for spreading falsehood that damages reputation or decreases revenue. This webcast will assist the hospitality professional to respond to negative reviews. It will provide the viewer background information intended to assist hospitality professionals in (1) distinguishing between expressions of opinion (which are protected) and statements of purported fact (which are not); (2) responding informally to negative reviews; (3) determining how legal counsel can efficiently and effectively assist; and (4) avoiding potential liability under state statutes that might apply in legal actions brought to curtail speech. The webinar will also overview principles established by very recent appellate court decisions pertaining to online reviews. About the presenter: Clifford S. Davidson, Attorney, Sussman Shank LLP, is a commercial litigator with jury trial experience. Throughout his career, he has focused on commercial contract disputes, entertainment and intellectual property litigation, First Amendment litigation, counseling in the areas of privacy and data security, and insurance coverage. 1031 tax exchange could offer good tax benefit to hospitality asset owners seeking to improve their hotel portfolio. Named for Section 1031 of the United States Internal Revenue Code, this investment strategy is essentially a swap of one business for another, allowing an investor to change the form of their investment without cashing out or recognizing capital gain. This allows the investment to grow tax deferred – avoiding tax until an actual sale for cash. Learn about the 1031 tax exchange process during the HBI Hotel Investor’s Marketplace Webcast scheduled for September 10 when Tony DeGeorge, President of Hotel Brokers International, will welcome guest speaker, Rochelle Stone, President and Founding Partner of Starker Services, Inc. Starker Services is the nation's oldest, largest and most experienced independent Qualified Intermediary firm, successfully completing thousands of exchanges each year. Rochelle has been active in the 1031 exchange industry for over 20 years and is a nationally recognized speaker, teaching exchanging and investing techniques to investment and professional groups. •and, what to look for when selecting a Qualified Intermediary. Attorneys Joseph A. Field of Field Jerger LLP and Richard M. Saltzman of Giambrone & Saltzman, LLC will join HBI President Tony DeGeorge via the organization’s webcast series - Hotel Investor's Marketplace to discuss franchise agreement negotiations, terms and conditions as well as tips on how to get ahead of the foreclosure curve and reach resolution with the bank. Register now for this complimentary webcast. Methodology for the appraisal process may change based on the asset being valued, but the end goal is always the same – establishing monetary value. Hotel valuation, a highly specialized process, is different from valuing any other cash flowing real estate as the appraiser must give consideration to four elements: land, business, improvements, and personal property. Join the Hotel Investor’s Marketplace Webcast on March 5, when Adam Cowart, MAI, Senior Appraiser and Director of Operations for Cowart Hospitality Services and HBI President Tony DeGeorge will discuss new trends emerging in hotel valuation, how hotel lending criteria has changed in recent years, and what impact this has on the valuation process. An improved economy brings rise in the dreaded hotel PIP. Hotel brands are requiring franchise property owners to deal with property improvement and deferred maintenance issues that were put on the back burner while the country weathered the economic downturn. The concept of reinvesting and improving your hotel to maintain and increase the asset’s value makes sense; however, with the economy showing only modest growth, hoteliers are reluctantly letting loose of the purse strings. Kevin Brickner, Vice President at Wyndham Worldwide and Daniel Couture, Sr. Director of Product Improvement at Choice Hotels International, join Charlie Fritsch, president of Hotel Brokers International to discuss the PIP process from inspection and negotiation to budgeting and execution. Presentation featuring the most up-to-date and recent hotel performance trends data as tracked by Smith Travel Research. Join Charlie Fritsch, president of Hotel Brokers International, and Jeff Higley, vice president of digital media & communications for STR/STR Global/HotelNewsNow.com, as they discuss the hospitality real estate industry market and opportunities for investment. This year, HOTEL BROKERS INTERNATIONAL conducted their annual HOTEL FINANCING SURVEY in partnership with HOTEL BUSINESS magazine. The survey – now in its 19th year – was distributed to nearly 200 hospitality industry lenders and examined the types of loan products available in the market, requirements for generating hospitality loans and opinion on the status of the lending industry this past year and through 2013. During this Webcast, Dennis Nessler, editor of Hotel Business, will join HBI President Charlie Fritsch to discuss the hotel financing market and share the results of this survey with the hospitality investment community. The U.S. hotel industry reported increases in all three key performance metrics for fourth quarter 2012 in year-over-year measurements, according to the data tracked and compiled by STR and STR Analytics. 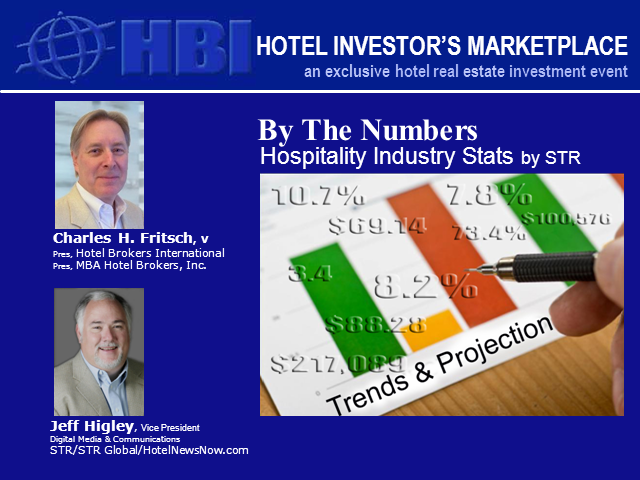 On March 13, Stephen Hennis, Director of STR Analytics, will join the HBI Hotel Investor’s Marketplace Webcast and HBI President Charlie Fritsch to take a detailed look into the hotel performance data and review which regions, markets, and segments were the greatest contributors to the increases posted in 2012. Could the industry’s occupancy, ADR and revenue per available room continue this upward trend throughout 2013 and 2014? As Director of STR Analytics, Stephen Hennis oversees specialized consulting projects and the development of new STR products and services. Mr. Hennis has over 17 years of experience in the analysis of lodging investments. He has appraised and evaluated over 500 lodging facilities, and has been involved in the underwriting, negotiation and acquisition of luxury hotels and resorts. Meeting the needs of all lodging industry participants for in-depth, comprehensive analysis of hotel industry performance data, STR Analytics provides an extensive range of services and creative applications to a variety of clients. STR Analytics offers the unique combination of experienced lodging industry experts and STR’s unparalleled international hotel database. STR Analytics is based in Boulder, Colorado. STR is the recognized leader in providing accurate, actionable information and analysis to the lodging industry. Since 1985, the company has served the industry operating on the key principles of integrity, confidentiality and customer service. As the year winds down, we look toward 2013. How will the hospitality real estate and finance markets differ from 2012? What new opportunities will the New Year bring? What, if any, impact will the United States Presidential Election have on the hospitality industry? Be a part of the conversation as our panel of hospitality industry professionals - Charlie Fritsch, Hotel Brokers International; Laurie Ivy, PMC Commercial Trust; and Joe McCann, Optimum Hotel Brokerage – look toward 2013 and discuss the issues most important to hotel real estate investment, financing and operation. Gain insight into hotel real estate investment. Check the temperature of the market. Preview the most recent hotel listings and obtain information from leaders in brokerage, franchise, finance and media.